Hannah and Adam shared their baby news with OK! Magazine and I’ve added the scans to the gallery. 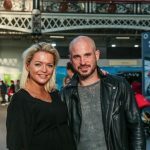 In the full interview they talk more about the pregnancy as well as Hannah’s previous miscarriages and her implant related health problems. A possible S Club 7 reunion for their 20th anniversary is also mentioned but nothing has been decided yet. Many thanks to Bev for the scans!